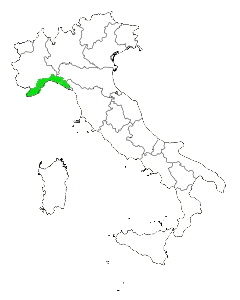 The Liguria region of Italy is the north western most region that has a coastline on the Mediterranean sea and is often marketed as the Italian Riviera. The region has a raggedy boomerang shape to it and is long and narrow with its length of about 150 miles but at its widest point is only about 30 miles. Like so many of the other northern regions Liguria shares a border with France but just a little bit on its western edge. The region also shares borders with the Italian regions of Piedmont to the north, Emilia-Romagna to the east and Tuscany to the south. The region has an area of about 2093 square miles has 235 towns, an overall population of about 1,617,788 with its capitol city of Genoa being just about in the center of the region. Other notable towns worth mentioning are La Spezia to the south, Savona to the west and Sanremo to the far west. This region is billed as the Italian Riviera and from about 10 miles south of Geona to it’s border with France it is almost non stop beach's to the south it is more hit and miss. There are many beach resorts north a few south, the rest of the coast is either rock covered or has cliffs. One thing unique about the area is the climate, because the mountains come so close to the sea and keeps temperatures warmer in winter and the area has a much different type of foliage than you would expect in this part of Italy with palm trees, citrus fruit trees and many other types of subtropical plants in the region. Being that palm trees can survive over the winter would be a good indication that the region could be pleasant place to visit in winter.